Lagging financials have been the missing ingredient in this bull. Financial stocks will finally come into their own this spring. Bank credit meanwhile continues to support the strong economy. Investors have gotten a taste of what they can expect in the next few weeks of earnings season. With earnings expectations lower than they’ve been in years, companies from most major industries will surprise on the upside and push the major indices higher. In today’s report, we’ll look at the financial sector stocks, which are in a position to outperform during the latest earnings season. I'll make the case here that the banks should return to a leadership and relative strength positions versus the S&P 500 Index (SPX) in the weeks to come. Earnings season got off to a good start last week with some positive results from Dow 30 components JPMorgan Chase (JPM) and Walt Disney Co. (DIS). The latest earnings also helped lift the benchmark SPX above the psychologically significant 2900 level for the first time since early October. As several potentially market-moving corporate earnings results will be released in the next couple of weeks, the market is poised for more positive surprises. Although increased volatility can always be expected at the front-end of earnings season, I still expect the SPX to decisively overcome its September 2018 high this month. JPMorgan Chase shares rose by nearly 5% on Friday after it reported consensus-beating Q1 earnings. The bank reported net income of $2.65 per share for the first quarter, which was well above analysts’ expectations of $2.35 per share. Revenue for JPM in the quarter was a record high $9.18 billion, above the $8.71 billion in Q1 2018. The bank’s earnings beat was greeted by many participants with a huge sigh of relief given investors’ lowered expectations heading into the latest earnings season. It wasn’t just JPM that exceeded expectations, however. Even problem-plagued Wells Fargo (WFC) saw a 16% increase in its Q1 profits while revenue fell less than anticipated. The upbeat earnings for the banks that have reported thus far have been a welcome development for Wall Street. The reason is that the economically-sensitive banks are sending a message that the U.S. economy is healthier than anticipated. This vote of confidence in the economy is reflected in the latest rally in the recent liveliness of the Financial Select Sector SPDR ETF (XLF), below. XLF broke out of a multi-week lateral trading range last week and looks to finally catch up with the SPX, which it has lagged for most of this year. If my analysis is correct, we should see the leading banks and broker/dealers not only catching up with the SPX but surpassing the index on the upside this spring. Assuming the financial stocks resume a place of leadership vs. the S&P, we’ll have yet another solid indication that this bull market has room to run in the coming weeks and months. The basis for this bullish financial sector forecast is that the U.S. economy is much stronger than most analysts and economists give credit for, as the latest bank credit figures show. Below is the long-term trend in bank credit growth, and it illustrates steadily rising loan demand. Bank credit has been expanding on a yearly percentage change basis, which is good news for the economic outlook. Every recession of the last 40 years has been preceded by a sharp decline in bank credit, as can be seen in the graph below. Internally, the stock market remains in excellent shape as we head further into April. 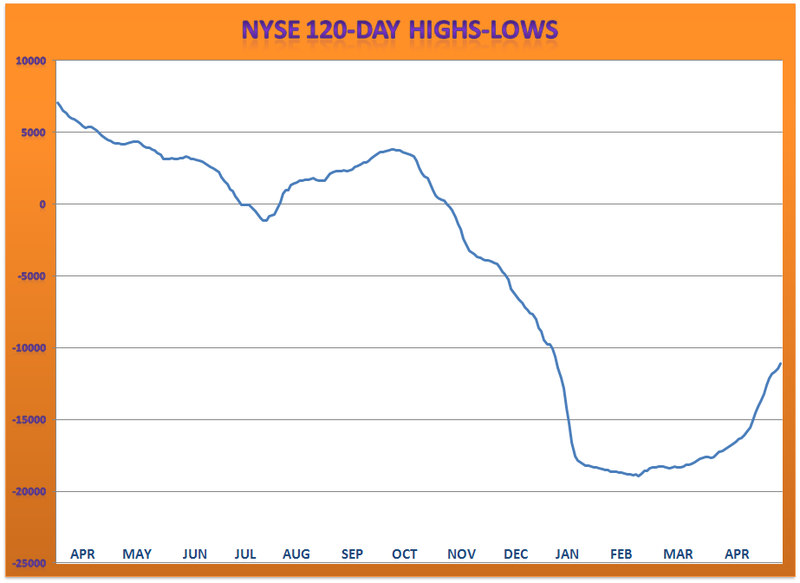 The all-important 52-week NYSE new highs and lows are a case in point. On most days in the month to date, the new high/low ratio has been anywhere from 7:1 to 15:1 in favor of new highs. That’s a sign that the incremental demand for equities remains firm. Also, the daily number of stocks making new 52-week lows has been well below 40 almost every day this year. This confirms that internal selling pressure on the Big Board is non-existent and supports a bullish outlook for equities. 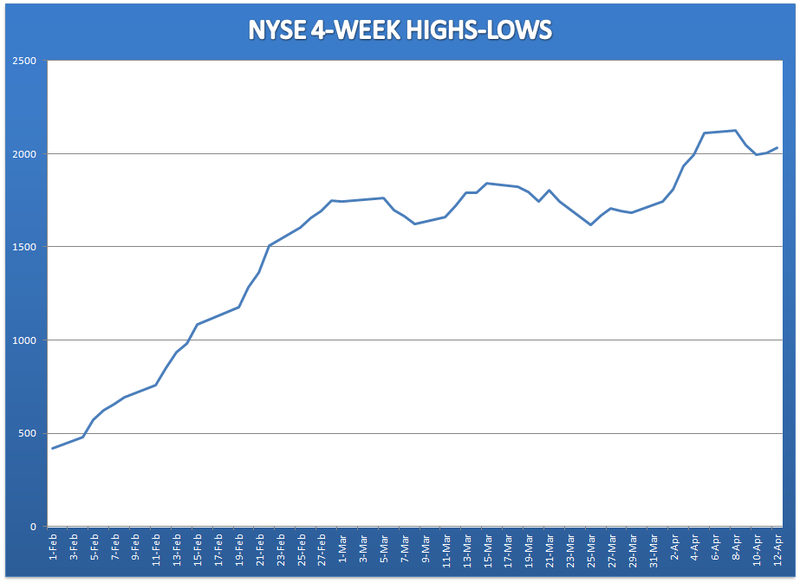 My most important indicator for gauging the near-term path of least resistance for stocks, namely the 4-week momentum of the new highs-lows, is still rising and therefore supportive of a buoyant stock market. See the chart below which is a good reflection of the incremental demand for stocks. As long as this indicator remains in a rising trend, a bullish short-term stance is justified on the part of investors. Now what about the longer-term trend? With the major indices on the verge of testing the previous all-time highs from last summer, traders and investors are understandably getting nervous. Will the old highs be taken out and the bulls retain control of the market trend? 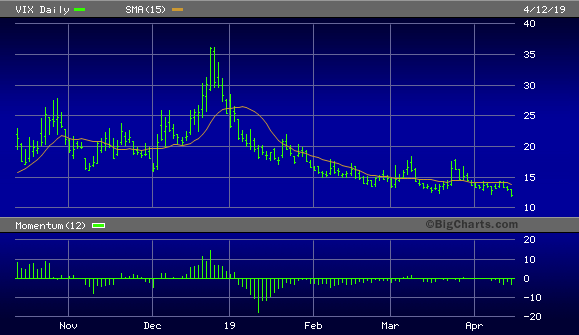 Or will participants bail out at as the old highs are reached, content with a “break-even” trade? Will the bears then regain control of the market trend? These questions will soon enough be answered, but one of the most useful indications that investors have nothing to fear from the bear can be seen below. This graph shows the 120-day rate of change (momentum) of the NYSE 52-week highs and lows. I consider this to be the ultimate crisis indicator, for every major decline (i.e. 15% or greater) in the SPX has been preceded by the 120-day highs-lows indicator declining for several months prior to the event. As the above chart shows, this indicator was in decline for several months prior to the fourth quarter market plunge last year. However, since bottoming earlier this year, the 120-day momentum indicator has been steadily rising and is reflecting no internal weakness. Whenever this indicator is declining steadily, it indicates a weak undercurrent of potentially dangerous proportions. But when the indicator is trending higher, it supports a stable and bullish intermediate-term (3-9 month) trend for equity prices. Financial news headlines meanwhile reflect continued caution on Wall Street. Instead of a plethora of news articles reflecting the latest earnings-related market rally, we’re seeing headlines which betray an ingrained skepticism among analysts and investors alike. An example of this was the MarketWatch article which drew attention to the plunge in Wall Street’s favorite fear gauge, the CBOE Volatility Index (VIX). The consensus view of the analysts quoted in this article is that the next big move in the VIX would likely be to the upside, implying a potentially sharp stock market pullback in the near term. This is a healthy attitude that analysts are expressing, for it reveals a degree of fear that stock prices are “too high.” It suggests that stocks aren’t over-owned and that there is still plenty of short interest to fuel future rallies. Readers of this report know that I view this as a contrarian indicator and that widespread fears of another market correction are a sign that the bull market’s “wall of worry” is still intact. In summary, earnings expectations have been set so low by Wall Street analysts for Q1 that it should be very easy for earnings to continue surprising on the upside. With internal momentum on the NYSE still trending higher, stocks have a rising path of least resistance and should encounter little trouble in responding to positive earnings news. 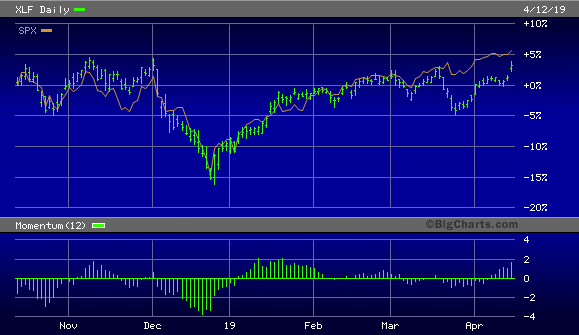 Financial sector stocks, particularly the major banks, should return to a position of leadership in the coming weeks. Wall Street is also still quite cautious, which supports the market's rising trend from a contrarian perspective. In view of this combined evidence reviewed here, investors are still justified in maintaining a bullish bias. On a strategic note, traders can maintain a long position in my favorite market-tracking ETF, the Invesco S&P 500 Quality ETF (SPHQ). I suggest raising the stop-loss to slightly under the $31.40 level for this ETF trading position on an intraday basis. Only if this level is violated will I move to a cash position in my short-term trading portfolio. Meanwhile, investors can maintain longer-term positions in fundamentally sound stocks in the top-performing real estate, consumer staples, and healthcare sectors.